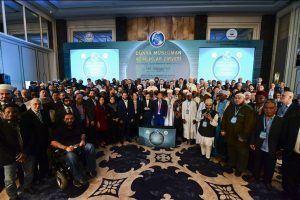 The “World Muslim Minorities Summit” organized by the Presidency of Religious Affairs of Turkey was held in Istanbul from 16th to 19th April with the participation of President Recep Tayyip Erdoğan. President Recep Tayyip Erdogan called for Muslim unity and brotherhood during the World Muslim Minorities Summit that began in Istanbul on Monday. He said just like the direction of the Qibla — the direction that a Muslim takes when praying — is same, the hearts of all Muslims are also same despite them being in different locations around the world. Erdogan said attacks on Muslim minorities had become commonplace in many countries. “Today, attacks on Muslims and refugees have become commonplace in many states that practice democracy and law,” he said. He added that Muslim homes and workplaces, as well as places of worship, have been targeted by racist and fascist groups almost on a daily basis. The Turkish leader mentioned the fact that several anti-Muslim attacks have been reported in Germany, the Netherlands, Belgium and France. “Muslim women are being harassed on streets, at workplace just because they wear headscarves. “The western world wants to defend its own ideology and way of life through anti-Islamism. “Islam, which is the only religion that can respond to the depression of modern people, is being given labels through pre-planned terrorists,” Erdogan said. He added that terror groups like Daesh, Boko Haram, Al Shabab and FETO were harming Musli-ms as well as giving an opportunity to anti-Muslim circles. 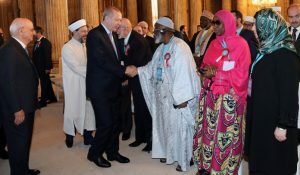 The countries that press Muslim states on minority rights do not see ethnic cleansing of Muslim minorities in many African and Asian countries, according to Erdogan. “We should not allow these hypocrisies to keep us from our path and our righteous struggle,” he said. “Muslims have no problem in living together in peace with other religions and never have [had any such pr-oblems] throughout history,” he added. He urged Muslims to continue their struggle against “double standards”. Prime Minister Yıldırım stated that the minority problem was a global issue and that Muslims were very closely and directly concerned, and said, “Today, about one-third of the world’s Muslim population is treated as a minority in the countries they live in. The worst problem Muslim minorities are facing is the rise of anti-Islamism in the West, or Islamophobia and anti-minority issues. Islamophobia is a human rights problem rather than a religion-caused problem. The baseless fear towards Muslims, enmity and hate rhetoric is one of the contemporary reflections of Islamophobia, racism and xenophobia. With this definition, Islamophobia should be regarded and assessed as a particular kind of racism, which includes many historical, sociological, and political causes just like antisemitism. As a particular kind of discrimination, Islamophobia is on the focus related to many issues among others, such as freedom of religion, right to work, right to education, and freedom of speech. The hate rhetoric driven by enmity against Islam and social exclusion threaten societal harmony, multiculturalism, and coexistence. Human rights and democratic values are being crumpled every day because of Islamophobia. That being the case, dimensions of rising extremism in Europe and anti-Islamism will reach even graver levels if necessary steps are not taken. World Muslim Minorities summit had 211 participants from 103 countries. Several Caribbean Muslim Communities were represented at the Summit, including those of Grenada, Barbados along with those from Latin America. President of Religious Affairs Erbaş noted that “The ‘World Muslim Minorities Summit’ is the most vivid sign that Islam meets with humanity regardless of time, place, race, color, language, status and gender, and will continue to do so until the last day”. President Erbaş said that the summit was being held in order to have discussions with religious leaders of the Muslim presence in different parts of the world and to improve cooperations. Our world, under enormous problems at social, cultural, political, and economic frontiers and under the siege of global crises, is going through one of the most difficult periods in its history. All ideologies and policies tried with the claim to bring to humanity peace, tranquillity and prosperity have lost their credibility. Almost half of the world’s population are struggling with hunger and poverty. More than 100 million people have been forced to leave their homelands and are trying to survive as refugees. We see sadness and mourning in whichever photographs of humanity that we look at. The Islamic world is also undergoing difficult and distressing processes under wars, occupations, violence, and poverty. Cries in pains and tears are rising in the cities of Islamic world such as Gaza, East Guta, Damascus, San’a, Kabul, Tripoli, Mogadishu, and Myanmar. Especially Islamic societies have been affected the most from the developments in the last two centuries, particularly from colonial and invasive policies. Occupation and oppression for the Islamic world began with orientalism studies, and the Islamic world was exposed to brutal interventions. Imperialist powers have not withdrawn their hands from the Islamic world in times of struggle for freedom and declaration of their independence. A number of projects have been launched to destroy connections between Muslims in the world and to weaken their fraternal feelings, and these insidious activities continue even now. I would like to emphasize that in the last two centuries the feelings of fraternity, unity and solidarity in the Islamic world has been facing efforts to be weakened by producing dissension and discord on differences, ethnic identities, denominations, and dispositions. On the one hand, terror and violence, poverty and ignorance remain to be major problems affecting the vast majority of the Muslim world. The situation of our brothers who continue to exist as a minority may become even more vulnerable in some countries. One of the greatest slanders against Islam by the orientalist studies is that Islam, the religion of mercy, has spread through violence. Today, in order to embody this false perception, bloodthirsty terrorist organizations have been established that exploit the basic concepts of Islam. It is very clear that behind terrorist organizations such as DAESH, Boko Haram, Al-Shabaab, there are dirty relations of interest. Such puppet organizations created by international power groups are in fact tools aimed at separating Islam’s message of mercy and justice from our young people in particular. Such groups that disregard any humane and moral values destroy the historical, cultural, aesthetic, and architectural heritage of the Islamic civilization in an ideologically conditioned fashion. In this spiral of violence, actually notions and principles of Islam are being distorted and destroyed, thus damaging the feelings of common values, unity, and brotherhood. Another extremely important point is that these terrorist organizations hidden behind the most insightful concepts of Islam such as jihad and martyrdom are also causing spiritual destruction as well as material destruction. The images of savagery brought to the world agenda by treacherous hands through the media serve Islamophobia on a global scale. The fear and hatred created by the Islamophobia industry has the potential to turn into a total hostility towards both Islam and Muslims. As a matter of fact, at this point, the physical attacks and violence against Muslims and places of worship increased, freedom of belief and worship of Muslims have begun to be restricted, particularly in some European countries, significant discrimination has arisen in the social fields such as employment and education. It appears that in many European countries, political parties have been running election campaigns on Islamophobia-based propaganda to get votes, and terrorist organizations have tried to reconcile a religion sent to take people from darkness to light. Islamophobia, however, should be considered a crime against humanity all over the world. Muslims need to prepare alternative statements, action plans, and spread them all over the world in the fight against Islamophobia. It is essential that the vulgar, alienating, and anathemic discourse of the Islamic scholars in introducing Islam should not be tolerated; instead, the moderate, inclusive, embracing, and graceful style and religious discourse of scholar as in the unique example of our Prophet should be encouraged. 1. 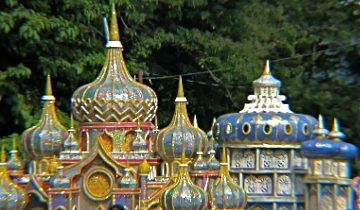 Muslims, representing the religion and civilization of Islam, have displayed the most exclusive examples of law, justice, equality, compassion, and good morals throughout history in the regions they have lived and in the civilizations they have established and have always been protectors of minorities, the oppressed, and victims of all sorts. Today, problems and crises in the individual, social, and global dimensions can be solved and overcome by the reunification of humanity with Islam’s principles of fairness, law, mercy, and compassion. 2. It is the most natural right of all minorities to protect themselves without discrimination of religion, language, race, colour, gender, and geography, to preserve their cultures, beliefs, and languages, to improve their social and traditional structures, and to raise and educate their young generations with this approach. Protecting under all conditions and circumstances the rights to life, property, reason, religion and progeny, granted by Islam for each individual at birth, is essential for the peace, security, tranquillity, and stability of the earth. 3. It is a crime against humanity that any minority community, regardless of which part of the world they live, be humiliated on the basis of nationality, gender, colour, culture, religion and language, be persecuted, be tormented, be forced to change their religions or names and to relinquish or renounce their cultural values, be exposed to assimilation and/or genocide. It is not acceptable and explainable in the civilized world that in the present day, when all human rights and fundamental freedoms are guaranteed by international agreements, neglect, exploitation, violation, and attacks on the rights and freedoms of ethnic and religious minorities continue. 4. On the basis of justice and equality, ethnic and religious minorities have the right to enjoy all kinds of social rights and opportunities provided by the government in the fields of education, health, employment, etc. Multiculturalism and law of coexistence are indispensable for democratic societies and countries in real terms, respecting human dignity and rights. Any overt or covert discourse, propaganda, activity, or formation that violates this must be strictly prohibited by deterrent legal acts. 5. Multifaceted pressures and attacks targeting Muslims as a pretext for September 11, 2001 terror attacks continue to increase in many parts of the world. All approaches and practices, which disregard rights and freedoms, should be viewed regardless of perpetrators and purposes, and it must be regarded as an irrecusable responsibility on the part of all states, international institutions, and organizations, without exception, to prevent, whatever the cause and effect, any kind of violence against the freedom of belief and worship. 6. Our sublime religion of Islam and its sincere followers have nothing in common with terrorist organizations, each of which abuses people’s pure feelings by exploiting religious values and notions for their servile objectives with the rhetoric of religion, thus making people objects and victims of violence, and in fact, is a product of factitious projects. It is out of question that rough, shallow, solid, uncompromisingly literalist, anathemic and violence-biased approaches, and practices can refer to Islam –religion of love, affection, compassion, and justice. Moreover, it is also obvious that this kind of understandings, approaches, and formations makes the greatest damage to Islam and Muslims. 7. Islamophobia, a project of animosity against Islam, is a serious human rights issue that involves dirty interests and racism behind it. Islamophobia is a treacherous and dark project aiming to present Islam in the world opinion as an ideology fostering violence and terror. The real intention of those trying to introduce this concept into the literature is to create an environment of dissension, friction and conflict between cultures, societies, religions and civilizations under all conditions and circumstances, thus benefit from chaos. Therefore, it is imperative that the Islamophobic activities, which do not serve any purpose except sowing the seeds of enmity among the people and societies from different beliefs, be considered crimes against humanity. 8. It is obvious that the Islamic world has been affected the most from colonial and invasive policies and the subsequent global problems. The ongoing terror and wars in countries like Arakan, Palestine, Iraq, Syria, Afghanistan, Somalia, Libya, and Yemen have attempted on the lives of millions of Muslims, and caused them to abandon their homelands and face hunger and poverty. Unfortunately, the greatest victims of this painful and embarrassing situation are innocent children, women, and the elderly. It is an urgent duty and responsibility for all persons, institutions, organizations, societies, governments, and international organizations in the name of dignity and honour of humanity, to end all kinds of occupation, attacks, terror, and wars. 9. There has also been a significant increase in racist attacks and aggressions on the homes, places of worship and businesses of all immigrant and refugee communities as well as the alienating, hate-mongering, and discriminatory rhetoric against ethnic and religious minorities on the immigrant and refugee communities in various parts of the world, especially in the West. The neglect shown in finding the perpetrators of such crimes and exercising injustice encourages racist aggressions and potential criminals, as well as undermining the trust in law and strengthening the perception of discriminatory and double standard policies in the countries in question. It is inevitable that this hypocritical, contradictory, and illegitimate attitude will make an irreparable harm to the peace and tranquillity in societies. 10. Efforts shown in recent days to make Quds the capital city of an occupying society are a futile endeavour that will not go beyond increasing dissension, conflicts, and chaos. We strongly condemn and refuse this reckless approach disregarding humanity, the old customs, and the international law, and serving nothing other than hindering peace and adding fuel to the flames. For all Muslims, Quds is the capital of Palestine and will remain so forever. Muslims will always side with al-Aqsa Mosque and Palestine just as they have taken a stand against occupation and persecution by the oppressed throughout history. 11. Muslim minorities around the world should, first, strengthen friendship, solidarity, affection, and cooperation among themselves, and develop consultation methods and strategies for joint solution of problems. Internal problems must be resolved without being converted into dissension and conflict, and they need to act prudently under the guidance of the Qur’an and Sunnah. 12. In Islam, knowledge, insight, wisdom, and morality constitute integrity. Throughout history, Muslims have instilled hope and confidence in the world through a revelation-based, reasonable, moderate, and inclusive approach. Today, all Muslims should refrain from all kinds of accusatory and alienating words, approaches and behaviour, which harm unity and solidarity, disturb peace and tranquillity, and foster dissension and discord. 13. It is inevitable that differences of ethnicity, sect, and disposition, which are in fact the means of mercy, turn into the means of dissension and discord, and damage the brotherhood and unity. Transformation of problems in the Islamic societies into turmoil, chaos, and conflict is a convenient excuse for external interventions and makes matters entirely irresoluble. Therefore, Muslim communities have to find methods to solve their own issues in their peculiar ways, with mutual tolerance and understanding, without hesitating to self-criticize and confront themselves when necessary. 14. Muslim minorities should demand and follow up with their civil rights in a manner respecting the administrative and legal norms of the countries where they live. In this sense, it is important to create a well-organized, well-equipped, open, transparent, inclusive, and peaceful structure with organizations at local, national, and global levels. 15. Muslims should be role models and encourage for values such as helping, sharing, kindness, grace and good morality, and be peacemakers introducing the benevolent and bright principles of Islam to the humanity. Likewise, they should exist with an exemplary and successful stance in all areas of social, political, economic, and educational life with steps taken to instil hope and confidence. 16. The FETO terrorist organization, a treacherous and dark network founded as a tool for dissension, discord, and terrorism by secret global organizations in the Islamic world, has revealed itself with the disloyal coup attempt on July 15, 2016 in Turkey. This religion-exploiting terrorist organization, which has distorted and destroyed the perception of Allah and the Prophet, Islamic notions, humane and moral values, is a global threat and calamity for both the religion of Islam and all Muslims on earth. This dark organization, led by Fetullah Gülen, is trying to maintain their treacherous activities with the support of global evil groups, taking on the role of religious service. Today, it is necessary to be cautious and sensitive against the FETO terrorist organization, which targets especially Muslim minorities, and their propaganda should never be regarded. In this respect, it is important that all Muslims should cooperate in a conscious and devoted manner, and continue to struggle with them. 17. It is obvious that there are dirty relations of interest behind terrorist organizations such as DAESH, Boko Haram, Al-Shabaab and the like, which emerge especially in the Islamic world, and commit violence and terror by abusing sacred values of Islam. These puppet terrorist organizations, produced by the power struggles and insidious global projects, are ruining cities and destroying the historical, cultural, aesthetic, and architectural heritage of the Islamic civilization. These terrorist organizations, which do not bring anything but blood and tears to the Islamic lands and kill the Muslims constantly, are especially fooling the young people in the occupied regions, and in the immigrant or minority communities, and abusing them for their treacherous objectives. It is a vital responsibility for all Muslims to work in cooperation to protect young people from falling into the hands of these subcontracted terrorist organizations. In this context, Islam’s principles of right, truth, affection and compassion, and our civilization’s knowledge, wisdom, morality and ideals of law should be well explained and taught to the new generations. 18. It is very important that Muslim minorities, who are an integral part of the Islamic societies in the world, be in constant communication with the consciousness of ummah, morality, and law based on brotherhood, and that they act in unity, collaborate on problems and needs, and develop collaborative works. In this context, sharing experiences and collaborations, particularly in religious education, publications, and services, should be made stronger, more comprehensive, and institutionalized. 19. It is clear that the presence of Muslim minorities in their societies through their fundamental rights and freedoms, their positive contributions to the country and the world they live in can be achieved by being qualified individuals, and it is certain that qualified human power will be provided with an effective and high quality education. In this sense, Muslim communities should establish international educational institutions and research centres to take new steps to strengthen their cooperation in education and culture, and to contribute to build a better and peaceful life and world. In addition, these institutions should be centres that work, analyse, and produce scientific and literary publications, projects, strategies for the solutions to the basic problems of Muslim minorities. Within this scope, the “Foundation for Solidarity with International Muslim Communities” (MUDAV – Uluslararası Müslüman Topluluklarla Dayanışma Vakfı) was established by the Presidency of Religious Affairs in Ankara to conduct studies in the fields indicated above. Report compiled from various Turkish sources.